The prettiest roses have the cruelest thorns—or, in this case, laser parasols and spinning skirts of doom. At distance[sic] or up close, they're not a threat to be taken lightly. Watch for the flash after they've opened their parasols; that's a sure sign you're about to eat beam. The good news is that blasting that laser takes these lades temporarily out of commission. Use that time to make it a permanent retirement! 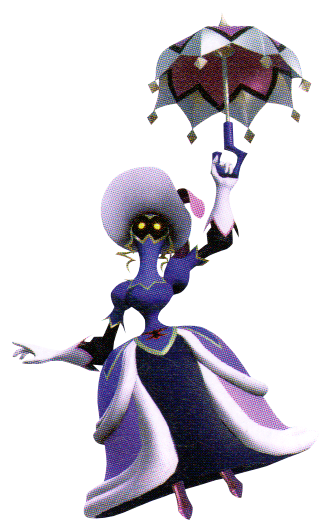 The Parasol Beauty is a Heartless that appears in Kingdom Hearts III.